A number of years ago, a Supernova Search Committee was officially established as a separate committee of the AAVSO. Until that time, the Supernova Search Program had been under the guidance of the Nova Search Committee. The purpose of the Supernova Search Committee is to search for, and discovery of, supernovae in deep sky objects, and all other related activities. Standard equipment for this search is a telescope capable of making useful observations of galaxies (usually "seeing" 14th magnitude stars, at least), and a collection of reference charts and photos showing the normal appearance of all the galaxies which the observer is currently monitoring. These reference materials might include the Supernova Search Charts and Handbook, by G. Thompson and J. Bryan Jr. (Cambridge University Press), and photographic or CCD atlases of galaxies, a number of which are now available commercially or privately. AAVSO finder charts also exist for a number of galaxies. Reference pictures of galaxies may also be obtained on the Internet, although magnitudes of reference stars gained from this source may be inaccurate by half a magnitude or more. 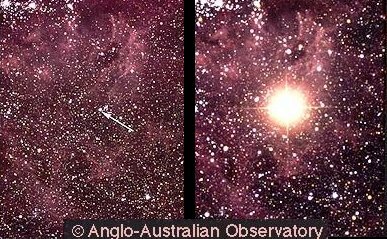 Negative galaxy observations, and observations of supernovae, should be reported to the AAVSO. Those who are interested in becoming involved in the search for supernovae should contact AAVSO headquarters, and obtain a copy of the AAVSO Supernova Search Manual.